Anne Hardy (2018) Falling and Walking, Leeds Art Gallery. Courtesy of the artist. 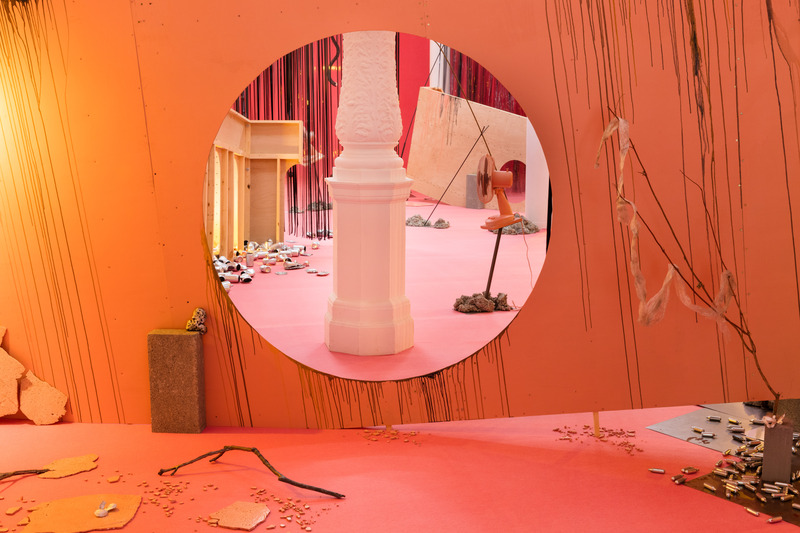 Anne Hardy’s immersive installation ‘Falling and Walking (phhhhhhhhhhh phossshhhhh crrhhhhzzz mn huaooogh)’ (2017) is a riotous salvo of colour, noise and materiality. Originally commissioned for London’s Art Night 2017, and newly acquired by the Leeds Sculpture Collections, the work transforms the White Room into a sensory landscape; a mise-en-scène meticulously constructed using sculptural, audio and light elements. Hardy casts us as the protagonists within this environment – inviting us in. A hulking black billboard engulfs the gallery entrance; think fairground hoardings plastered with photographic renderings of figurative chalk drawings. The theatricality builds as we remove our shoes and receive a hand stamp before stepping beyond the threshold. As I begin jotting down thoughts in the space, the invigilator – kindly, but firmly – reprimands me. He explains that Hardy has banned all distractions (from mobiles to notepads) in an attempt to focus our wandering minds. This isn’t a bad thing. After a few bewildering minutes, Hardy’s sculptural landscape slowly reveals itself; a heap of silver nitrous oxide canisters lay scattered amongst lumps of concrete. Sloping wooden structures, suggestive of movie sets and abandoned buildings, punctate the space. Small metal orbs cast shadows across sheets of cracked air-dried clay. 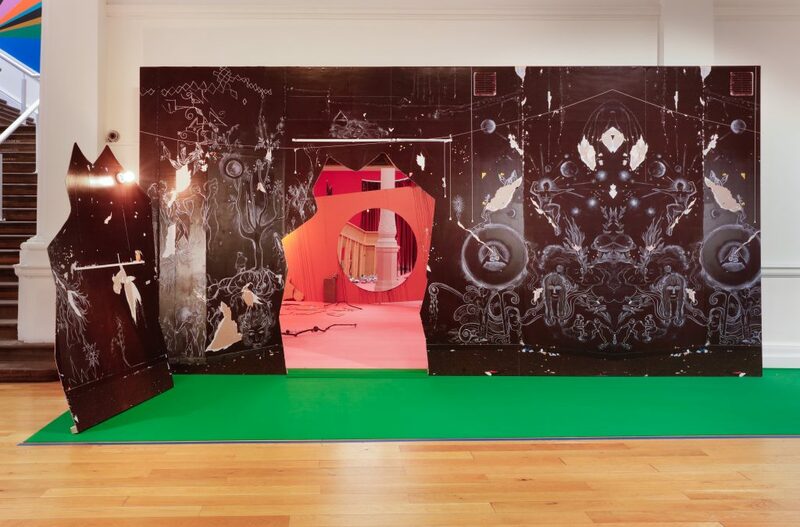 These formal and organic sculptural forms are framed by a lush pink carpet, which acts as both a Kippenbergian playing field and photographic backdrop, a link to Hardy’s interest in the discourses of photography. As you gradually move between the objects, the light and sound dramatically alters; lights plunge into darkness and the sound of rain hammers down. On cue, several pink oscillating fans suddenly whirl into life, blowing long black strips of vinyl tape hanging from protruding poles. I feel lost, increasingly aware of the soft carpet beneath my feet. The mimesis invites Freudian free-association, which opens up countless different readings. The point of departure for what Hardy’s ‘FIELD’ works (her term for these installations) is the city and, in particular, the liminal spaces of East London. These urban spaces, the cracks in the fabric of the city, are where Hardy gathers discarded materials, sounds and narratives that are dynamically reconfigured. Sound places a crucial role in unifying these elements. The looping abstracted soundtrack triggers shifts in lighting and ambience. Hardy’s process recalls Christian Marclay’s ‘Pub Crawl’ (2014), a Saturday morning dérive, playfully knocking empty bottles found in the street to create an aural map of hung-over East London. Hardy’s theatrical set-piece thrillingly teeters between abstraction and reality, recasting the complexity of urban life in an expansive manner. Like the modern city, ‘Falling and Walking’ draws you in and overwhelms you. This is reminiscent of Mike Nelson’s epic installation ‘The Coral Reef’ (2000), which created a rich – but disorientating – parallel reality drawn from the aesthetic and cultural structures of the modern capitalist city. Both works rely heavily on stoking associative narratives and sensory reactions of the viewer. However, the beating heart of ‘Falling and Walking’ is Hardy’s powerful sculptural sensibility; at first glance the installation appears to be utter chaos, but, in reality, it is absolute order. Falling and Walking (phhhhhhhhhhh phossshhhhh crrhhhhzzz mn huaooogh), Leeds Art Gallery, Leeds, 1 March – 20 May 2018. The exhibition is on display as part of the exhibition Leeds Sculpture Collections across Henry Moore Institute and Leeds Museums and Galleries. Jack Welsh is a freelance arts producer, researcher and writer based in Liverpool.